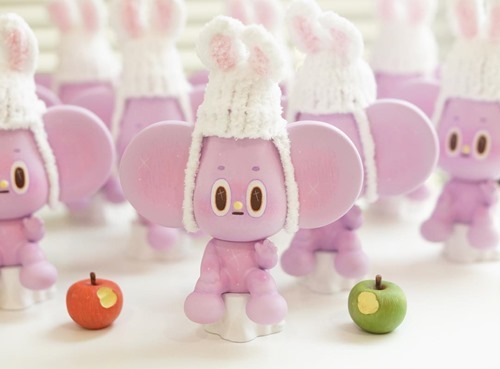 Korean artist Kettle Boy is releasing the last edition of his Rabbit Starfy figures in three colors. With their extra large ears and curious design, the hand-made Starfy resins stand out with their own personality even in a crowded market of cute toys. Rabbit Starfy is for available for pre-order in Purple, Pink and Blue editions for $155 ($23 shipping) via an easy google form. The pre-order closes on Thursday (1.17) at 3 AM PST. While not explicitly stated, this appears to be a lottery. Successful pre-orders will be confirmed via email along with an invoice on Thursday at 6 AM PST. These are scheduled to ship mid-February. Mighty Jaxx is going to make Yoskay Yamamoto collectors very happy this weekend. The brand-new Wish Upon a Me Sunrise edition comes roughly 3.5 years after the America edition which dropped in June of 2015. 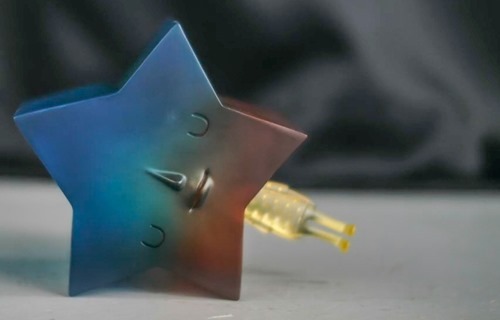 The first to feature translucent resin, Sunrise features a tranquil red to blue fade on the star face and a yellow body. Mighty Jaxx will release the Sunrise edition this weekend on Saturday (1.19) at 6 AM PST assuming they stick to their well-established release schedule. For more about the Sunrise edition and the Wish Upon Me figure, check out the Mighty Stories: Wish Upon Me video feature from which the above image was captured.